Conturce Hostel i San Juan, Puerto Rico: Reservér nu! 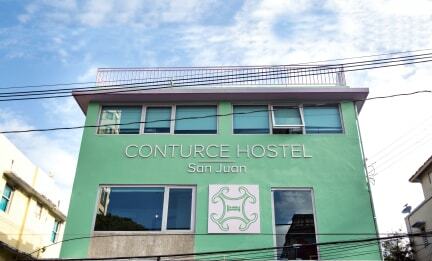 Conturce Hostel is located in Loíza Street, in the capital city of San Juan, Puerto Rico. This new, modern, luxurious and easy hostel is designed so that travelers from different places and cultures can share in common spaces, within an atmosphere of fellowship and camaraderie. 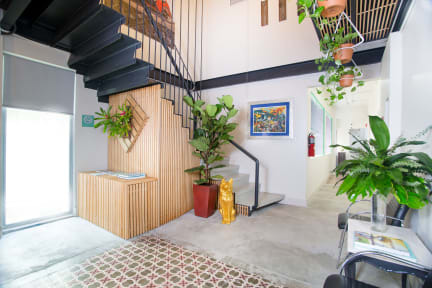 Located in the heart of urban San Juan, hostel guests can move around by walking, by bus or car to places of tourist and cultural interest, as well as areas of offices and businesses. In addition, it is located within walking distance of the supermarket, pharmacy, laundromat, cool restaurants, bars, coffee shops, and is just a couple blocks away from the beach! More specifically, we are at within walking distance of some of the most relevant city landmarks such as 'La Ventana al Mar' Park, the 'Jaime Benitez Condado Lagoon National Park' or the 'Museo de Arte de Puerto Rico', as well as other treasured landmarks. We offer dorms of different capacity for the most venturesome travelers. Enjoy the amazing view from the terrace and catch some rays while on vacation with friends. We have WiFi, fridges, lockers, bathrooms and showers in all rooms. Check in from 15:00 to 23.00. Payment upon arrival: major credit cards. The reception area is open 24 hours per day.